10 OCTOBER/NOVEMBER 2017 | Pr e s by te r i a n s To d ay A fter 170 years on Mount Hope Avenue, South Presbyterian Church in Rochester, New York, voted to sell its historic building on Easter Sunday 2014, a day the congregation chose for its symbolism of resurrection. "To commemorate the sale of the property, we held a combined service in August 2014," said the Rev. Deborah Fae Swift, pastor of South Church. "We presented the new owners, a Free Methodist congrega- tion, with the trowel used to lay the building's cornerstone in 1894, and used again for an expansion of the church in the 1920s." "None of us regrets selling the building," she added. "In fact, fairly often people from other churches will approach one of us with an 'I'm sorry for you' tone of voice, which catches all of us off guard." She added that South Church's evangelism coordinator recently replied to one person's well-meaning sympathy by saying, "Don't be sorry. We're not. It's the best thing that's ever happened to us. We have energy and are unencumbered now. We can just be about God's work without spending time, energy and money on a building." To the members of the congrega- tion, this kind of "church" is about a rekindling or revitalization of the Spirit's fire, rather than return- ing to the ecclesiastical life most remembered from their childhood. It's a model that measures success together for Bible study at a bagel shop, Christian teaching at a senior living community and a book discussion at a diner. Today the 16 AoF groups focus on three areas: worshiping communities, study and sharing, and social gatherings with a focus. Some groups are noticeably reli- gious (Prayer on the Lawn), while others focus on community building and have no mention of God, Jesus or church (Mount Hope World Singers). Almost all are member-led and all are equally significant in the life of the church. "The essence of the Acts of Faith model is simple: 'go where we are needed' and 'share the loving by the energy and excitement of the Holy Spirit's presence, more than by Sunday attendance, endowments or budgets. And it's an idea that has its origins in the first century church as recorded in the book of Acts, where believers were called to live in the world and to share their faith in everything they did day to day. 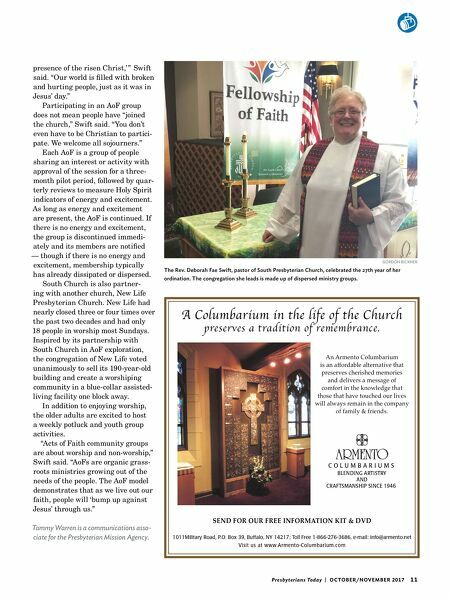 Taking that approach to heart, the 40 or so members of South Church touched nearly 500 lives in Rochester last year through 16 active, member-led Acts of Faith (AoF) community groups. South Church piloted the AoF model with three member-led com- munity groups in 2010–11. 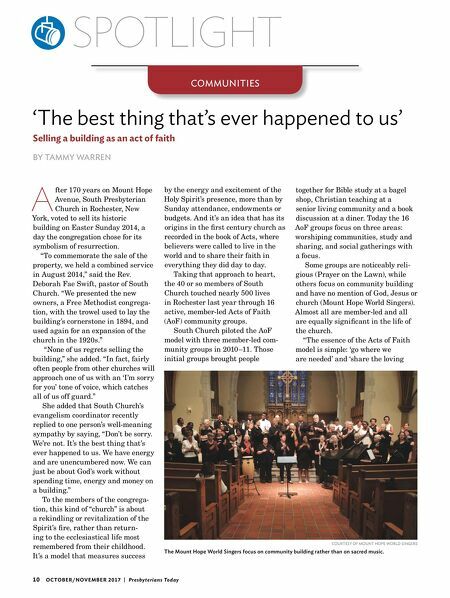 Those initial groups brought people SPOTLIGHT 'The best thing that's ever happened to us' Selling a building as an act of faith BY TAMMY WARREN COMMUNITIES COURTESY OF MOUNT HOPE WORLD SINGERS The Mount Hope World Singers focus on community building rather than on sacred music.